By this time in my pregnancy with Bella, she had a head-to-toe wardrobe of handknit woolens--booties, leggings, pants, sweaters, hats, mittens. And what does baby #2 have? Hand-me-downs! I'm only kidding, but just barely. Here is Peanut's first sweater. I found this pattern to be wonderful. How much do I love Elizabeth Zimmermann? LOTS. The loosey goosey gauge did make me a little nervous at first (her instructions say to use the right size needle to get the right size gauge to make the size sweater you need. Um, thanks, that was super, um, NOT helpful). I was glad I wasn't trying to fit a specific size. And also, thank goodness for Ravelry so I could figure out at least where to start on size. I admit I did have to rewrite the pattern so that it would be easier to follow in my put-down/pick-up world (it is originally written as 3 chatty little paragraphs). And it took me a ridiculously long time to learn the pattern stitch. But then again, I put the milk away in the cupboard the other day, so I would say I'm not exactly firing on all my smarts lately. Talk to me again in a few months when I'm not pregnant. Or wait, I guess I'll be sleep deprived for a couple years. Well, apparently my intelligence has peaked. That's unfortunate. My current project is so squealingly adorable: tiny Ballerina legwarmers. 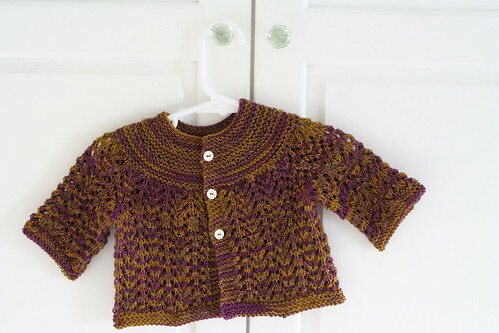 For Bella (back to knitting for child #1!) for her Hop'n'Tots class. I just scaled the ones I made for myself (from Last Minute Knitted Gifts) way, waaaaaaaay down. And they're adorable. I'll post pics.